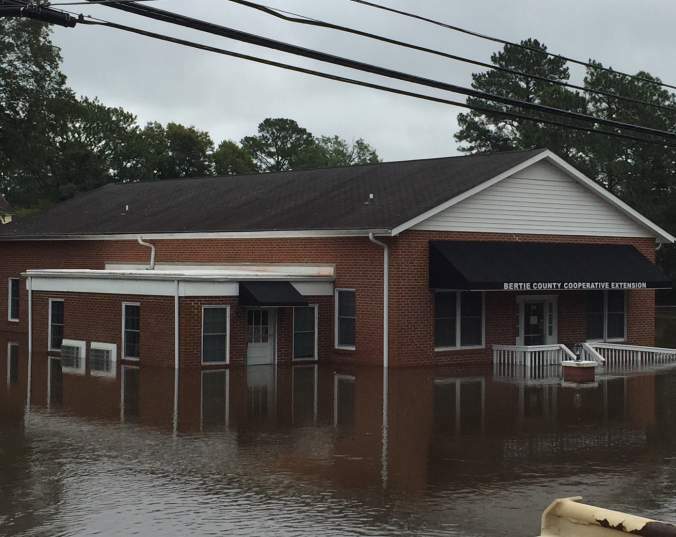 Bertie County and the town of Windsor suffered two major flooding events in 2016 – including Hurricane Matthew’s devastation across the eastern part of the state. Like other communities hit hard by the storm, Windsor lost multiple community facilities all at once, presenting a financial dilemma to prioritize restoring many critical structures at one time. The Golden LEAF Foundation, chosen by state leaders to distribute hurricane relief funds quickly and efficiently, designated critical funding to help these communities. By the end of December, 2017 – just over a year after the storm’s flooding – Bertie County and the town of Windsor had received disaster recovery monies for community needs including $500,000 for the library and cooperative extension joint use facility and $240,000 for the Teacher Housing Initiative, to ensure the schools in this community continue to be served despite the setback from a natural disaster. Another important aspect of the Foundation’s funding is to help communities build infrastructure to function on a day-to-day basis and, in communities like Windsor where flooding has been an ongoing problem, give them ability to make the right type of improvements to avoid future problems. Golden LEAF awarded $72,707 to the county to identify appropriate engineering options and best practices to reduce runoff and surface flow to the Cashie River and flooding in Windsor. The Foundation also provided a $311,720 grant to replace a Windsor pump station damaged by the floods and enable the town to move it from above ground to submersible – providing better protection against future flooding events.